Julia is calling them thugs who want Great Albania, but again without any proof at all. Albanian intellectuals simply gathered to speed up the process of Kosovo’s independence and they called all Albanians to gather around this program. Yes they stated they will fight if necessary but that is simply a response to their Serbian neighbors who are preparing to some "holy crusade war". 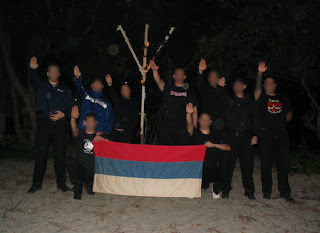 Serbian nationalists plan to form a paramilitary unit to prevent ethnic-Albanian Kosovo from gaining independence from Serbia, a report said Monday. 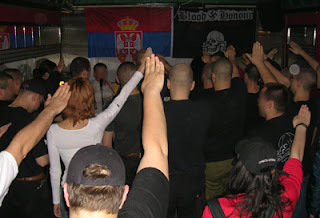 Zeljko Vasiljevic, president of the Serbian veterans organization, said the nationalists will create a “Christian militia” to fight Kosovo’s ethnic-Albanians, who are mostly Muslim, the Belgrade daily Danas reported. About 200 people gathered Saturday outside a Serbian Christian Orthodox church at Krusevac, 120 miles south of Belgrade, to set up the Guard of Prince Lazar, named after the leader who lost the 1389 Kosovo battle to the Ottoman Empire. Serbia was under Turkish rule for 500 years. Vasiljevic said police arrested 27 men dressed in black T-shirts with the insignia of the Serbian Red Berets special police unit, known for its activities in the 1990s Yugoslav ethnic wars. Members of the disbanded Red Berets are currently on trial in Belgrade charged with the assassination of Serbian Prime Minister Zoran Djindjic in March 2003.